VALERO TEXAS OPEN: The PGA Tour returns to the Lone Star State this week for the Valero Texas Open, an event that’s rich in history and tradition, having been in existence for nearly 100 years, and one that now has a new home on the schedule, replacing the Houston tournament as the final tune-up before the Masters. And let’s face it– Augusta will be at the forefront of everyone’s mind this week, fan and player alike, as the next four days also serve as the final chance for players to punch their golden ticket to Magnolia Lane. Nothing short of a victory is required now, as we’re now past the “top-50” cutoff date, but with only 15 guys in the field this week having already secured their Masters invite, there’s a good chance that the eventual champion will indeed be the final entrant into the year’s first major. 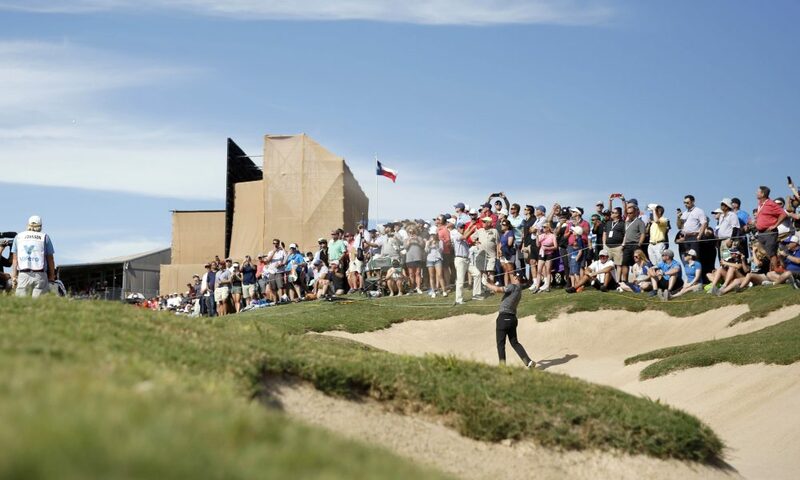 The star of the show this week will be the sprawling Oaks Course at TPC San Antonio, a Greg Norman design that measures over 7,400 yards and can be downright nasty when the wind blows, which it often does. The fairways aren’t overly narrow but the course always plays firm, and it can be difficult to avoid the trees, bunkers, and native underbrush that line most every hole. The sticky Bermuda rough and the undulating, difficult-to-hold greens only complicate matters, and the scoring generally reflects the rugged layout, as last year’s champion, Andrew Landry, became the first player in five years to post a winning score of lower than 12-under. Sungjae Im (33.0)- If you’re looking for golf’s next big thing, you may was to check out South Korea’s latest prodigy, the 21-year old Im, who has exploded onto the scene as a rookie with five top-10s… and we’ve only just crept into April. Im has been especially good over the past month, finishing 7th or better in three of his past four starts, including a T3 at Bay Hill a few weeks ago and a T7 in Puntacana last week, when he broke par in all four rounds and finished at 14-under. He’s a tremendous ball-striker, ranking in the top-20 on Tour in strokes gained tee-to-green, and thus far his best results have come on bermuda-dominant courses that are prone to high winds… courses like TPC San Antonio, in other words. Though this marks his first appearance at this event, he’s on quite a run and the field this week isn’t particularly deep, so this feels like a good opportunity to break through. I’m happy to take a chance on Im at a little better than 30/1. Joost Luiten (66.0)- The negatives with Luiten this week are fairly obvious: he’s never won on the PGA Tour, he’s never played this event, and this will be his first tournament in the U.S. this season, making one wonder how he’ll adjust. But he’s sure been playing some great golf, finishing 12th or better in three of his past four European Tour starts and ranking third on that tour in strokes gained tee-to-green, and fourth in strokes gained on approach. The Oaks Course is a ball-striker’s layout and Luiten has been flushing it all season, so this week sets up well for him in that regard. And though he doesn’t spend much time in the States, Luiten is a seasoned, world-class player who has proven capable of competing at the very highest level, as he showed again back in February with his 10th-place finish at the WGC-Mexico. At a price like 66.0, he may be the best value on the board this week. Dylan Frittelli (100.0)- Though he’s a native of South Africa, Frittelli has spent plenty of time in the Lone Star State, having played collegiately at the University of Texas, so he’ll know exactly what to expect at a course like TPC San Antonio. He played fairly well in this event last year, finishing 20th, and he comes in this week off a top-20 in Puntacana, so his game is in decent shape. Frittelli is an excellent driver of the golf ball, which should serve him well this week– he ranks in the top-5 on the European Tour in both strokes gained off the tee and strokes gained tee-to-green, and he’s found the top-15 in three of his past four starts on that tour. If you’re looking for a “live” longshot this week, you could do a whole lot worse.